In a book with children's rhymes and nursery rhymes I found this: "Sing a song of sixpence, A pocket full of rye; Four and twenty blackbirds Baked in a pie". Now, read these lines over and over again. 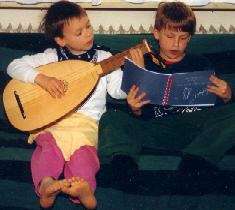 When they come out fluently, pick up your lute (or guitar) and pluck the open second course with the thumb in the same rhythm as your voice. Wait , hold on! Do you see the small figures that are placed before the tablature letter? Good, they show you which finger you should use to stop the tablature letter: 1 = index, 2 = middle, 3 = ring and 4 = your little finger. Now we're going to try something that's perhaps too hard for you. I've added a second voice that will make the little tune into a little solo piece. Here again, you will meet the small figures. Follow them and you're on the right path to real playing. Now to the right hand: Your thumb plucks the basses. 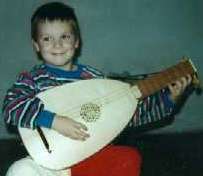 The melody is played with alternating middle and index finger strokes. Now, go ahead and practice, over and over again, slow and steady, and the blackbirds will appear! Wasn't that a dainty dish, To set before the king? There came a little blackbird, And snapped off her nose. She put her finger in her ear, And cracked it right in two.